Dog and puppy playpens are necessary and can be found in most households, where there are dogs. They have many different functions and are used for different purposes. 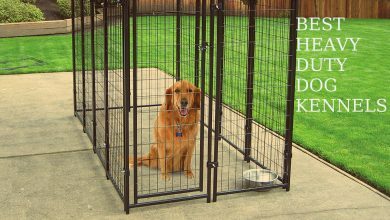 Dog and puppy playpens can be used as a play area, as a kennel, as a training tool, and many of them can be adjusted to pet gate or doggy door. 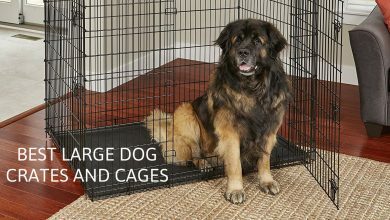 But, it is also important to know the right size a playpen should be according to the size of your pet. 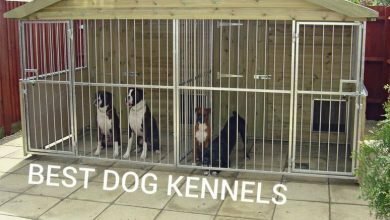 Too small and too large pet kennel used for training will not provide you with any results, and similarly with playpens. If a playpen is too small for the size of your pet of too big, it will not have any results. Playpen should be large enough to provide your pet with sufficient place to jump, walk around, play and sleep, but it shouldn’t be too large, making your pet think, that they are not restricted and placed in a playpen. 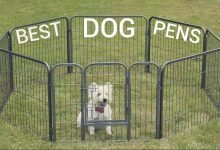 Hence, here is a list of the best small dog and puppy pens, designed for smaller doggy breeds and for puppy owners. The puppy play pen is manufactured by the North State company which is located in the United States of America, but they sell and offer their products all over the world in all parts of the world and in more than thirty countries. The material used in production in plastic, but the plastic is durable and is weather resistant, therefore you can use the playpen for puppies indoors and outdoors through any weather conditions. And, because of the water resistance, the playpen is also easy to maintain and clean, as you can rinse it with water and it will be fresh looking again. The high-quality small playpen is available in three different color options – gray, sand and color play. The color play option is designed for those, who like to have brighter and more playful doggy playpens and accessories, as each panel of the six panel playpen is colored in a different color – green, blue, orange, red, yellow and purple, hence the color play is going to be bright, fun and colorful design option. The dimensions of the six-panel playpen are 26.9 x 8 x 35.5 inches and they create an enclosed area of 18.5 square feet. But, if necessary, or if you have more than one furry friend, there is a possibility to buy additional two-panel add-ons, to create an even larger play area. But it will require spending some extra money. As the playpen can be used indoors and outdoors, the manufacturer has included non-slip pads, which will keep the playpen sturdy and avoid it sliding all over the house when used indoors and also, the non-slip pads will protect your hardwood floors from scratching. All in all, the North State puppy exercise pen is easy to set up and take down, and, when folded up, it will take up little space. Therefore, the North State puppy playpen is great for camping and traveling. But, the manufacturer has not included a doggy door, therefore if your puppy wants to come out, or you need to put it in, you have to detach one panel and create an opening. The Iris four panel puppy playpen can be used for many different purposes, as a training enclosure for your puppy, as an exercise pen, as a play gate and even as a dog fence. The playpen is made out of heavy-duty molded plastic, while still being lightweight. You will have no issues putting the puppy pen together and taking it down, so you can take it with you on different trips and when going camping. It will require few simple steps and less than ten minutes of your time. And even though the material used in heavy-duty molded plastic, folded up playpen will take up little space and you will have no problems storing and transporting it. The Iris puppy play pen is held up with full-length connecting rods, that interlock securely and holds up the pet pen sturdy. The manufacturer has also included non-skid rubber feet, which will be perfect for indoors, so there is no possibility for your pet to move the playpen for puppies around and, in addition, your floors will be protected from scratching. 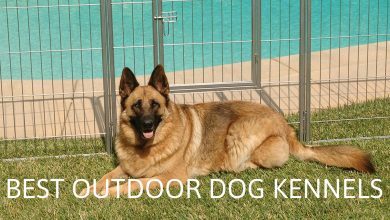 The four-panel design allows you to adjust the panels in any shape and form necessary, and even as a pet gate. Moreover, you can purchase addition two panels add-ons, which will increase the pet playpen size. And, if you are in a need for mesh roof, there is a possibility to purchase it separately for the four panel Iris playpen for puppies. However, if you add any add-on panels, then the mesh top will not fit anymore. 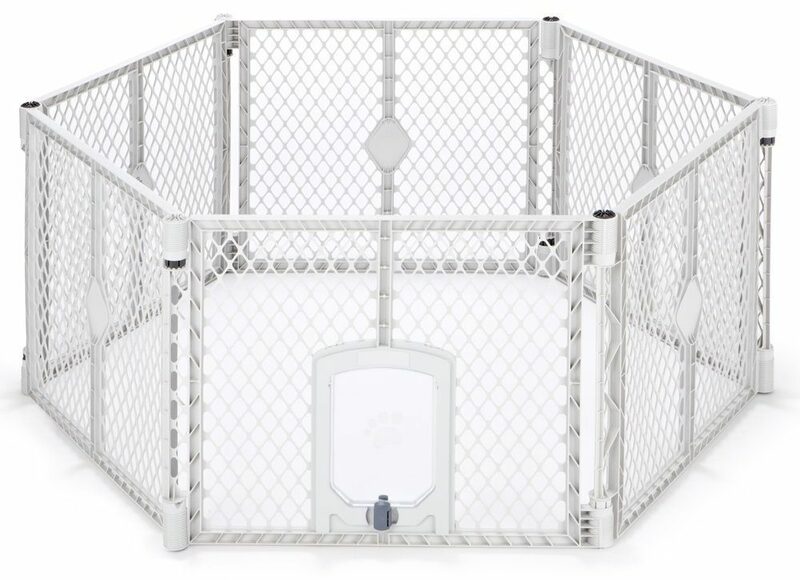 All in all the Iris small dog playpen is easy to set up and take down and will be sturdy because of the connecting rods that connect panels together. The locking latches on playpen door will ensure that your furry friend does not escape and the non-skid rubber will protect your floors from scratching and will keep your playpen in place. The Ollieroo puppy pen is modern and durable pet playpen, which is designed for small and average size doggies. 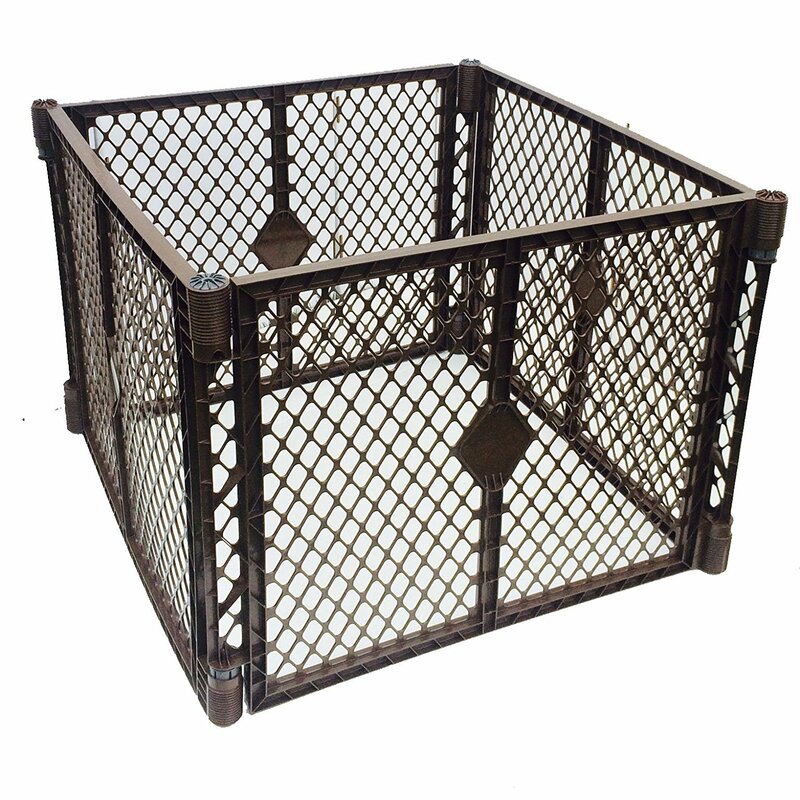 The puppy playpen can be used indoors and outdoors as the black e-coat finish will protect the steel construction against rust and corrosion. The steel panels are a string and coated throughout, therefore they will be long-lasting and durable in any weather conditions. The manufacturer offers four different sizes for these pet playpens, and each panel measures according to the size chosen. Also, there is a one door access available, which can be adjusted and set up in any place needed for the specific pet or house. The panels are easy to set up and take down and will require little assembling and effort. And no tools are required for the assembling process. You can set up the panels in any shape, size or form needed, making it very multifunctional and popular amongst many small dog breed owners. And, as the playpen is available in different size options, the price also differs accordingly to the chosen size. The bigger the playpen, the higher the price is going to be. All in all, the Ollieroo exercise pet playpen is a great purchase, as it is very lightweight and you will get good use out of it, not only in your home, but also in your backyard, and even when going camping and taking different trips. IT is perfect for when you are away, as you will not need any tools to set the pen up, and it can be done basically anywhere. The transportation and storage of the playpen are going to be easy as it folds down almost completely flat and takes up little space. 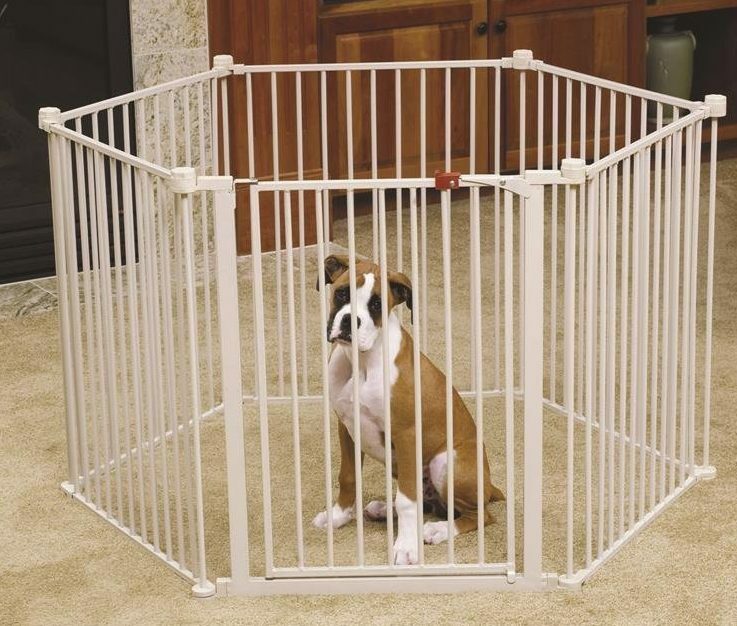 Even though these play pens are designed for all doggies, the manufacturer advises to use it only if your dog is trained and will behave well while in the pet pen. 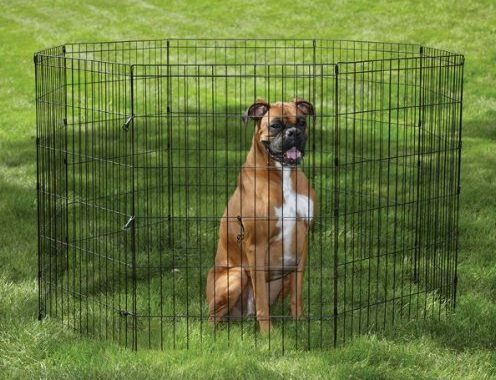 If your pet is wild or extremely active, the playpen will not be able to hold the doggy inside the pen. You need to properly introduce your pet to the playpen and to the idea of being well-behaved while in the playpen. The My Pet puppy playpen is high quality and durable six-panel area, which can be adjusted to be as large as 18.5 square feet and 26 inches in height. As the puppy pen makes up middle range space, it is more appropriate for small and average dog breeds. Therefore, if you have a larger pet, you might need to consider looking at more appropriate pet playpens. But, if you need a larger area, or you have more than one pet, there is a possibility to add an extra two panels. But, these two-panel add-ons are sold separately and will add expenses to your wallet. This puppy play pen is easy to set up and take down, as it comes already pre-assembled and no tools are required for setting up the playpen for puppies. It will take you only a few minutes, hence the playpen is perfect for traveling and camping trips. 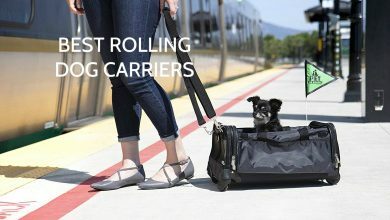 The manufacturer has also equipped the small playpen with a carry handle to ease the transportation and carrying process. The playpen itself is very lightweight, and when folded up, takes up little space, so you will not have problems finding a place for it in your car, or in your storage unit. They can be used in any place desired, outdoors and indoors. The small dog playpen is equipped with non-slip pads, which are meant to be used indoors, and will ensure that the puppy playpen is not sliding all over the floor and scratching the hardwood floors. And, when used outdoors, you do not have to worry about rust and corrosion, as the My Pet puppy pen is weather-resistant, which are also easy to maintain and clean. The convertible small dog playpen is designed, manufactured and sold by the Carlson Pet company, which is an American company, but they sell and offer their pet playpens all over the globe. 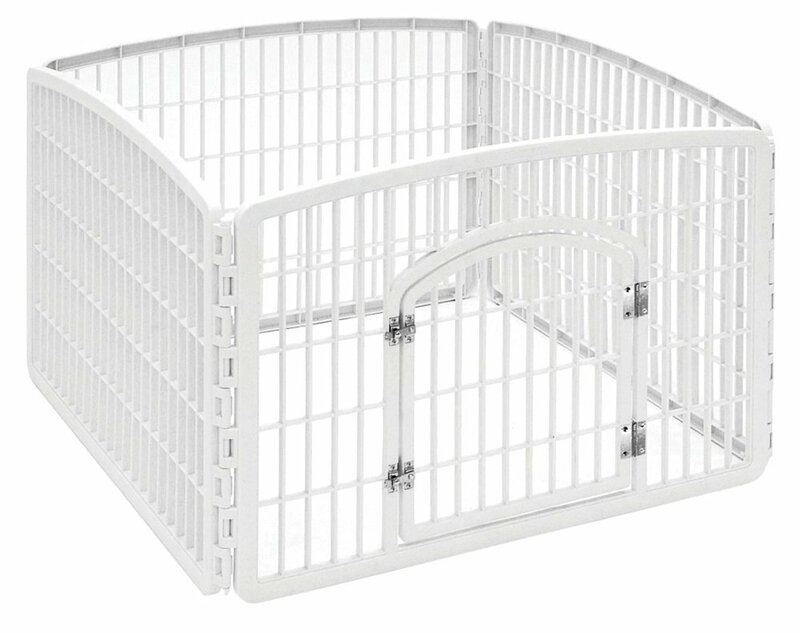 Their pet playpen comes only in one color- white, but they have manufactured it from steel, creating sturdy and long-lasting construction. For an easier walk through the puppy, playpen has been equipped with an easy release lever. The 28-inch height is suitable for most doggy breeds, so if you have a puppy, the puppy pen will be great for while your puppy is growing, and after, it will be suitable as a doggy gate, and blocking certain areas of your house, for example, bedroom and upstairs. And, they have also added a pressure-mounting system for easy wall installations, so you do not have to screw many different screws and nails on your walls all over your house. 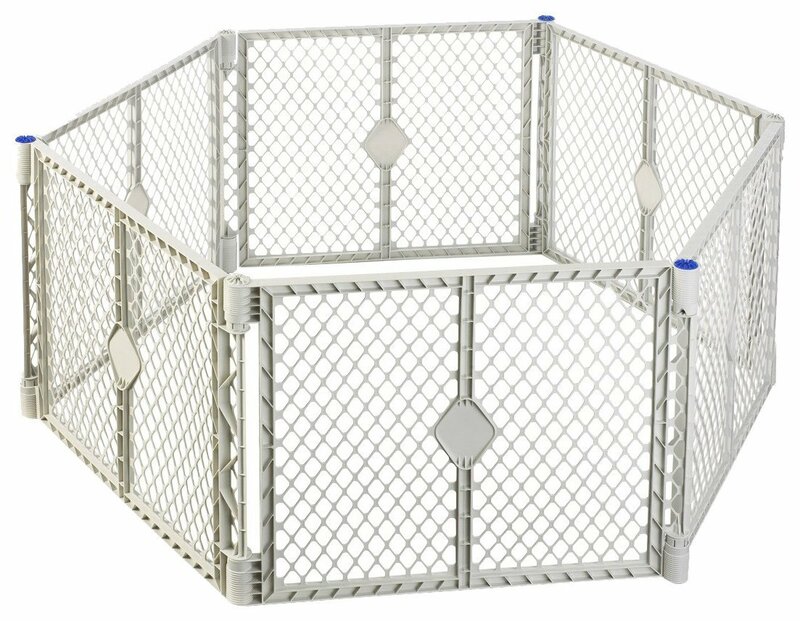 The Carlson Pet puppy play pen is great if you often want to transfer the pet playpen, use in various parts of your house or even take with you on trips and camping. As the construction is pre-assembled, making it very easy to set up and take down the playpen. In addition, the playpen for puppies will take up very little space when folded up, easing the storage and transportation. The Iris 24 inch small playpen for pets can be used indoors and outdoors, and it can be moved around frequently and taken on trips, as it is easily transferable and portable. They are very easy to set up and take down again as it takes only a few minutes. And when folded up, the playpen will take up little space so you have no worries about where to store the small dog pen, or how to take it with you when going on a trip or camping. Each panel measures 33 inches in width and 24 inches in height and together, the four-panel small pet playpen creates eight square feet of play area for your pet. The door which is installed on one of the panels’ measures 14 inches in width and 16.5 inches in height, therefore the Iris puppy playpen is made for smaller pet breeds or for puppies. The door has secure metal latches, which will keep your pet safely in the playpen, without any possibilities of escaping. But, if you need to create a larger play area, you can buy the two-panel add-ons and make as large of a play space as needed and add as many extra panels as desired. The playpen is made out of durable heavy-duty molded plastic, and it has protection against rust and corrosion, so you do not have to worry about letting it stay in the rain or snow. The manufacturer offers ten different colors, which provides the consumer a lot of choices. And if you are placing the playpen outdoors you can purchase additional mesh cover, but, it will fit only the four-panel construction. So, if you have added the extra panel add-ons, the mesh cover will not fit. 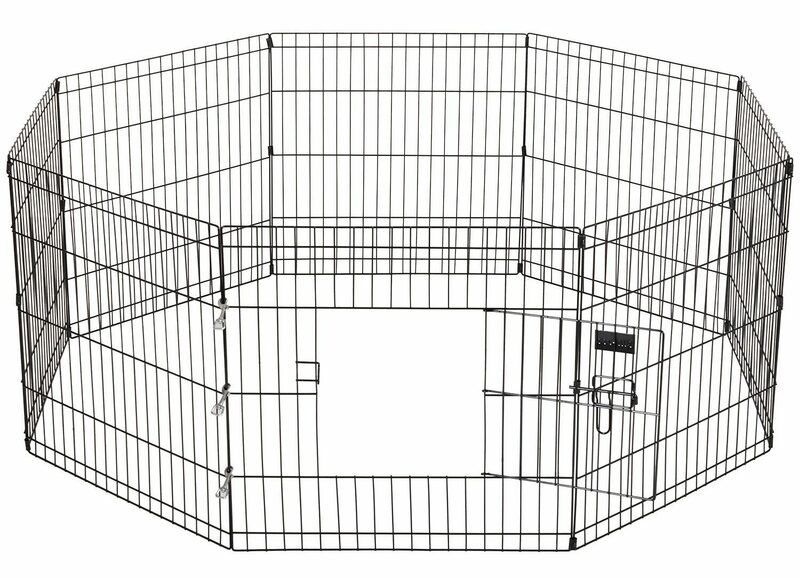 The Iris 24 inch four-panel puppy pen is affordable and easy to use. It comes pre-assembled so you have to spend little time to assemble and put the puppy play pen together. The Pet yard pet playpens are four-panel enclosure pet pens, which are 13 pounds heavy and can be made into an area up to seven square feet large. Unlike other small pet playpens, the Pet yard one consists only of four panels, which do not provide a lot of configuration possibilities. However, if the size is not large enough for your needs, you can purchase another four-panel playpen and add them together in order to create a larger play area. You can use this pet play area wherever you need as it can be used indoors and outdoors. Moreover, you can leave it in the rain without any worries as the materials are water resistant. For indoor use, the manufacturer has included non-slip pads, which will keep the playpen in place and avoid moving around your house and avoid scratching and ruining your hardwood floors. All in all, the Pet yard pet pens are easy to use and will be delightful when it comes to traveling and taking trips due to the lightweight construction and little space it takes up when folded. But, the only downfall is that it is very small, and might not fit most breeds, so you might want to consider buying this playpen only if you have a pocket-sized pet. Proselect pet exercise pens are very popular and great quality as they can be used for different purposes and are used by many different doggy owners all over the world. They do sell their products in all part of the globe through different online retail stores. This way, reaching a larger audience and being able to sell more products. 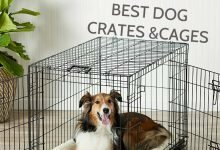 These pet playpens are great for many different purposes and can be used for dog shows, when traveling, while on the road and camping or simply for at home use. You will have no problems setting the pet pen up and taking it down as it comes already pre-assembled and the process will take only a few minutes without having to use any tools. 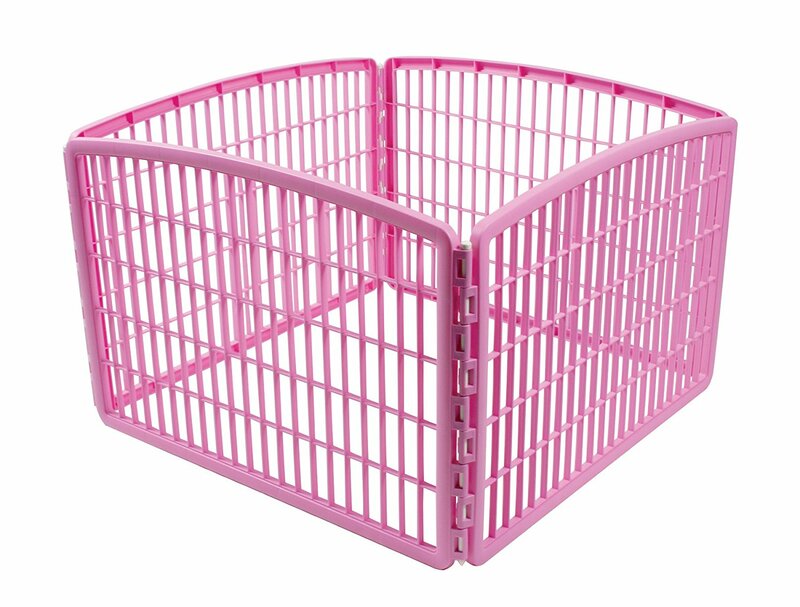 It will be appropriate for even the smallest doggy breeds and other small pets, as the wire mesh on the panels is very closely spaced, providing little escape possibilities. So, you can use the pet playpen for small and medium-sized pets, in any place needed and desired, as the playpen is designed to be transportation for pet owners to have the possibility of taking the pet and the playpen wherever they go. Different usage options – dog shows, when traveling, while on the road and camping or simply for at-home use. There are many different puppies and small dog playpens and different companies manufacturing them out there. They differ in the materials used in production, in size, in construction, in specifications and even in design and color. Firstly, you have to choose the appropriately sized pet playpen. After you have distinguished the necessary size, you can choose whichever pen meets your needs. To determine if you need a dog playpen that can be used in various places and weather, comes with accessories, like a carry bag, that comes in a specific color or maybe that is transformable, and you will be able to choose the best small dog and puppy playpen for you. Dog Houses with Amenities: Necessity or Luxury?